Doddridge County Park offers several trails, from the leisurely stroll to the challenging climb. With over three miles of trails currently and adding more each visitor can explore the creeks and hills of the Park. Please refer to the Trail Map to find entrance points, distances, trail ratings and intersection points with other trails. MAP COMING SOON! This trail can be accessed anywhere along the creek within the main park and by crossing over the bridge to Lone Pine Campground continue on to link with several more challenging and varied trails. 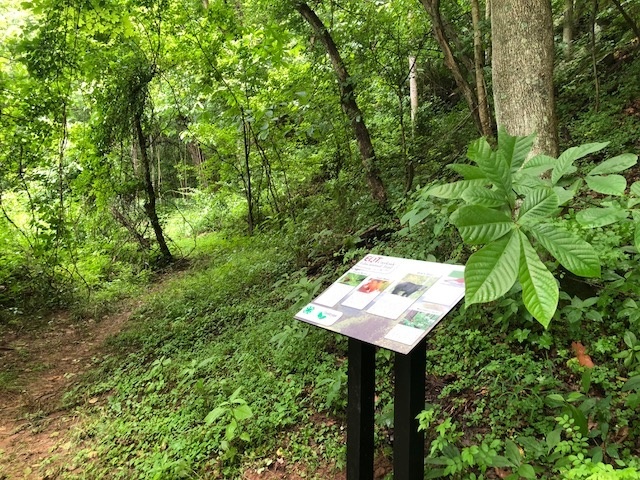 The EQT Trail offers a dozen kiosks along its length that provide information on floral and fauna native to the Park. Learn interesting facts about the trees, flowers, water creatures and birds you may see along your walk. This trail runs along the creek within Lone Pine Campground and offers a leisurely hike filled with creekside attractions and water venues. It also offers access to several fishing spots. Meathouse Fork Trail also provides the closest access point to the Park from the North Bend Rail Trail just eight tenth of a mile away. Portions may be closed due to high water when heavy rain persists. The Meathouse Fork trail (Upper) parallels the Lower trail but on a rise 50 to 60 feet up the hill. Provides a wide level path that offers plenty of vistas for you to take in. you can access the Upper Trail at Cut Road in the campground or at Table Rock area along the Lower Trail. This trail begins at Table Rock and runs trough a meadow and into the woods. A short trail off of Meathouse Fork Trail that provides a great intermittent stream to explore along with rock faces that offer some challenging climbing points. The Crossing trail bisects the parks trails and intersects with Old Farm Pond, Timber and Davis Trails along its run. A varied trial that at times follows a logging path and at others climbs and descends hills. The Davis trail runs along the middle of the hill face and provides great viewing of the Main Park, and considerable variety of trees, flowers and plants for identification. This trail is a short trail that connects EQT Trail with Davis Trail. It is a steep switchback trail with steps provided at points to provide an easier climb. The Timber trail is one of the longest trails and takes a hiker deeper into the Park. Running along an old timber road, the trail offers easy hiking with access to more difficult trails. The Overlook trail is a short trial off of Timber Trail that takes a hiker to the highest point in the park. At over 1220 feet the point provides great views of the Park and surrounding land. North Bend Rail Trail stretches 72 miles across north-central and western West Virginia. This wilderness path takes travelers across 36 bridges and through 10 tunnels and is part of the 5,500-mile American Discovery Trail, which spans the length of the United States. The trail has become one of the most renowned recreational trails through the Appalachians, and is known for its mountainous scenery and varied views of shaded tree canopies, rock cuts and farmland. Highlights include a 2,297-foot tunnel and the “haunted” Silver Run Tunnel. 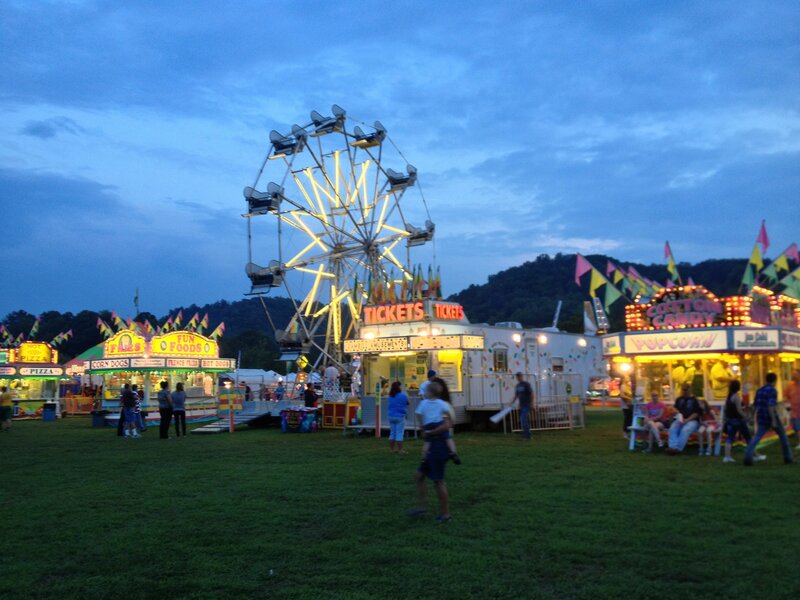 Each year in late August the park is transformed into magical amusement park, as we host the Doddridge County Fair. Pool is CLOSED FOR WINTER! Copyright © Doddridge County Park, 2017. All rights reserved.